Webinars, or online workshops, are insanely valuable marketing tools that will help you grow your email list, establish authority on a subject, and soft sell a product or promote a launch. But time and again, it's the nuts and bolts of hosting a webinar that can deter bloggers & creatives from actually using this powerful marketing tool. I've personally hosted or cohosted my fair share of webinars and live workshops, and have developed a workflow that I follow every single time. I'm able to host webinars directly on my website, completely for free, and I'm showing you how in this Step-by-Step Webinar Workflow. Learn all the steps to set up and host a webinar on your own website, including the emails and landing pages required to collect email addresses. Download your free checklist to help you with every webinar your host. All links to ConvertKit in this post are affiliate links. There are three main components to my webinar workflow: Email, YouTube, and Blog/Website. Follow-up email after webinar, including any reminder emails of promotions, time-sensitive deals, etc. You also need to think about any additional things you'll be adding to the webinar itself, or using as your presentation. You need to consider slides for your presentation, any free printables or worksheets you want attendees to use during the live event, and any promotional discounts to set up prior to the live event. Now, before you get overwhelmed with that list up there, let me assure you that it's not super difficult. You just have be sure you put all the pieces together, and I've also got a handy checklist for you to print out and use again and again. You're welcome! Alright, now that you have your checklist, let's break down all those steps, shall we? Mid - P.S. Because this is such a long tutorial, I've broken this post up into 3 pages. Page 1 is the Blog/Website component. Page 2 is the Email component.Page 3 is the YouTube component. I personally like to get all the pages on my blog set up before doing anything else, because I'll need these links for some of the email pieces of the workflow. I disable the Pin It button on this page, since I don't want this particular page shared on Pinterest. This is done through the Simply Pinterest plugin. I also disable all share options through my Shareaholic plugin. Again, I don't want this page shared since it's only for webinar registrants. As you can see, my thank you page is very simple. I created a header image for the page, add a click-to-tweet so registrants can share the webinar on Twitter, and gave them a few things to do while they wait for the day of the webinar. One of the cool features of ConvertKit landing pages is the ability to easily embed them on your own website. Why is this important? Because the link to your webinar registration will be your own website URL, rather than something like "app.convertkit.....". Simply add a new page to your blog, name it something like "10/13 Webinar Landing Page", then save it. In the Landing Page drop down menu, select the ConvertKit landing page you created, then publish the page. I use MotionMail to add a countdown timer to this page. The URL of this page will be used in my email sequence (Step 2 in the Email Component of the Webinar Workflow). On the day of the webinar, I remove the MotionMail countdown timer and add the embedded code of my YouTube broadcast, which we will get to in the YouTube component later. I also add a chat box using Chatango directly under the video. WANT TO JOIN THE WEBINAR SHOWN IN THIS POST? 10 WAYS TO PREP YOUR BLOG FOR 2017 IS HAPPENING THURSDAY, OCTOBER 13TH. I personally recommend using ConvertKit for the email component. ConvertKit allows you to create landing pages and easily connect them to email sequences and thank you pages. Log into ConvertKit, then head over to the Sequences tab and create a new sequence. I recommend naming this something similar to the name of your webinar for easy reference. I typically write pretty much the same email sequence for every webinar I host, just because it's easy to replicate, and I need to relay similar information each time. I remind registrants of the date and time of the webinar and give them the link to the live broadcast page, which we created in the Blog Component previously. I also tell them that I will send a few more emails on the day of the live webinar as reminders, then offer a few tips to help them make the most of our time together. When creating the sequence for your webinar, be sure to change the delay to zero so it sends immediately, change from "draft" to "published", then save. Head to the Forms tab in ConvertKit and select "Create Form". Instead of a form, you want to create a landing page. Design your landing page, write your copy, and be sure to click the "Edit Step 2: Form" button at the bottom. Step 2 is the actual form where your audience gives you their email address. Add an image and a short blurb here, then save your landing page and move to "Settings". Landing Page Name: You are the only one who sees this, but be sure to name it something you'll easily recognize. Redirect to another page:ConvertKit defaults to show a success message. Instead, choose to redirect to another page. This will be the URL of your thank you page, which we created in the Blog/Website component of the webinar workflow. Sequence Settings: Select the sequence you created in the previous step from the drop down menu. Make sequence mandatory for all new subscribers: Check this box so registrants don't have the option to opt out of the sequence at sign-up. The morning of your webinar: Remind registrants that your webinar is "today" and you can't wait to hang out with them. Include another click-to-tweet and tell them it's not too late for them to spread the word. One hour prior to your webinar: Let registrants know to tie up loose ends and get ready to learn. The same time as your webinar: Let registrants know "we're starting right now!" In each of these emails, you should include the link to your blog page where you are hosting the live webinar. Also, if you have created any free worksheets for this webinar, be sure to include those in each of these emails as well. The number of follow-up emails will depend on any promotions you offer during your live webinar. At the very least, you should have one email scheduled to go out immediately after your webinar ends. This email should thank registrants for attending, and let those who were unable to attend live grab the link to the replay, as well as any other information you need to convey. If you offer a limited time promotion, be sure to schedule more follow-up broadcasts as the limited-time deal comes to a close to remind registrants to take advantage of the deal before it's too late. (1) I can embed the live broadcast directly on my blog. (2) If, for some reason, my blog decides to be glitchy, the live broadcast is still happening on YouTube, so it serves as a backup. Tech happens. While this is technically optional, it adds a level of professionalism and custom branding to your live event. I use Canva for this because it stores my fonts and colors, and they have a template ready to go. Choose the YouTube Thumbnail template and design it however you like, then download your thumbnail. After your live event, just pop back into YouTube and add the custom thumbnail. Log into your YouTube channel and navigate to "Video Manager". Select the "Live Streaming" option in the left sidebar and click "events". Click the button to create a new live event. Name your event and set the date & time. Also decide if your event will be public or unlisted on your YouTube channel. 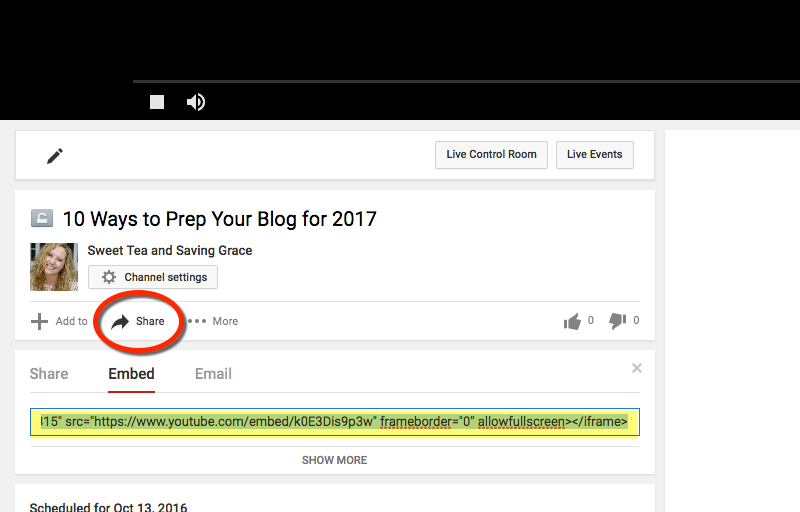 A public event is viewable to anyone who stumbles across your video on YouTube, even if they didn't register for your webinar. An unlisted event, however, is only viewable to those who have the direct link. This is the option I recommend for webinars. After scheduling your live event, you will need to add it to the blog page you created in Step #3 of the Blog/Website Component of the webinar workflow. Click the button in the top right corner of the scheduling page that says "View on Watch Page". Under your video, click "Share" then change the share option to "embed". This is the HTML code you will add to the text editor section of your blog page. Also remember to create your chat box using Chatango and add the HTML code directly under the video on your blog page. Now all that's left to do is host your live webinar! Use the form below to download your FREE Checklist! And don't forget to sign up for the live webinar, 10 Ways to Prep Your Blog for 2017, this Thursday, Oct. 13th! Click HERE to register!